Looking For a New Home for Your Boat? Whether you're looking for a Wet Slip to keep your boat in the water and ready to go or stacked Dry Storage to keep your boat clean and dry, our state of the art facility has just what you're looking for. 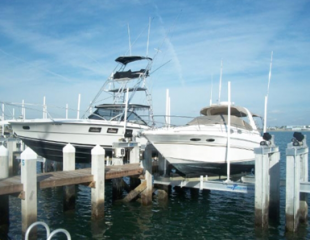 Contact the team at Bluepoints Marina at Port Canaveral today to find out how we can help. 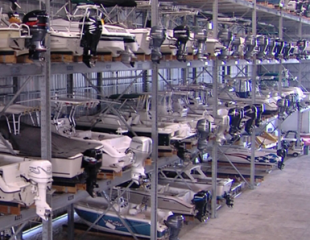 Our Fully Enclosed Dry Storage facility protects your boat from harmful UV Rays, wind-blown dirt and debris. You'll spend less time cleaning your boat and more time in your boat on the water. Are you and your family ready to get out on the water? Give us a call before you leave the house and we'll have your boat ready, plus we can stock it with bait, ice, beverages, snacks and sundry items. Bluepoints has the only 150 MPH Wind Load Rated fully enclosed dry storage facility in Central Florida plus the most comprehensive Fire Suppression System of any marina in the state. Each slip is equipped with a 50,000 lbs. boat lift, potable water and metered electrical service. Plus, we have 24 hour gated access and no height restrictions. Leave her rigged and ready to go. At Bluepoints Marina in Port Canaveral, the service is outstanding. Chip and his team do an outstanding job, and the facility is the most modern and well equipped at Port Canaveral. In every instance Bluepoints has gone out of their way to exceed my expectations while still having one of the best price points in the area. I would not even consider storing my vessel anywhere else. Bluepoints Marina is hands down the 'Class Act' of Port Canaveral, Before I bought my boat I checked out all of the marina options at the Port and nobody had the services, amenities, or the clean, new facilities that Bluepoints Marina has to offer. Mark | Team "Graphic Details"
Bluepoints Marnina in Port Canaveral makes having a boat while living in Orlando a pleasure. Our boat is always clean and well taken care of. The staff always goes the extra mile.